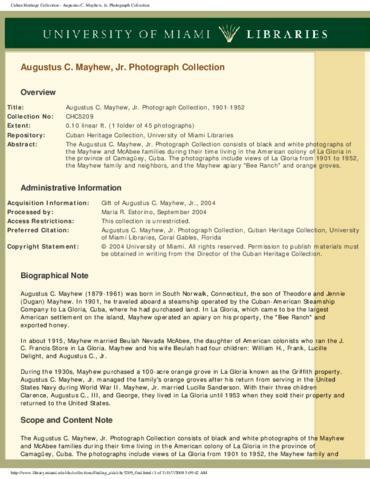 Augustus C. Mayhew (1879-1961) was born in South Norwalk, Connecticut, the son of Theodore and Jennie (Dugan) Mayhew. In 1901, he traveled aboard a steamship operated by the Cuban-American Steamship Company to La Gloria, Cuba, where he had purchased land. In La Gloria, which came to be the largest American settlement on the island, Mayhew operated an apiary on his property, the "Bee Ranch" and exported honey. In about 1915, Mayhew married Beulah Nevada McAbee, the daughter of American colonists who ran the J.C. Francis Store in La Gloria. Mayhew and his wife Beulah had four children: William H., Frank, Lucille Delight, and Augustus C., Jr.
During the 1930s, Mayhew purchased a 100-acre orange grove in La Gloria known as the Griffith property. Augustus C. Mayhew, Jr. managed the family's orange groves after his return from serving in the United States Navy during World War II. Mayhew, Jr. married Lucille Sanderson. With their three children Clarence, Augustus C., III, and George, they lived in La Gloria until 1953 when they sold their property and returned to the United States. The Augustus C. Mayhew, Jr. Photograph Collection consists of black and white photographs of the Mayhew and McAbee families during their time living in the American colony of La Gloria in the province of Camagüey, Cuba. The photographs include views of La Gloria from 1901 to 1952, the Mayhew family and neighbors, and the Mayhew apiary "Bee Ranch" and orange groves. NOTE: Two postcards were transfered from this collection to CHC0359: Cuban Postcard Collection. Sponsor Note: This collection was digitized with funding from the State of Florida Department of State, Division of Cultural Affairs, the Florida Arts Council, and the National Endowment for the Arts.